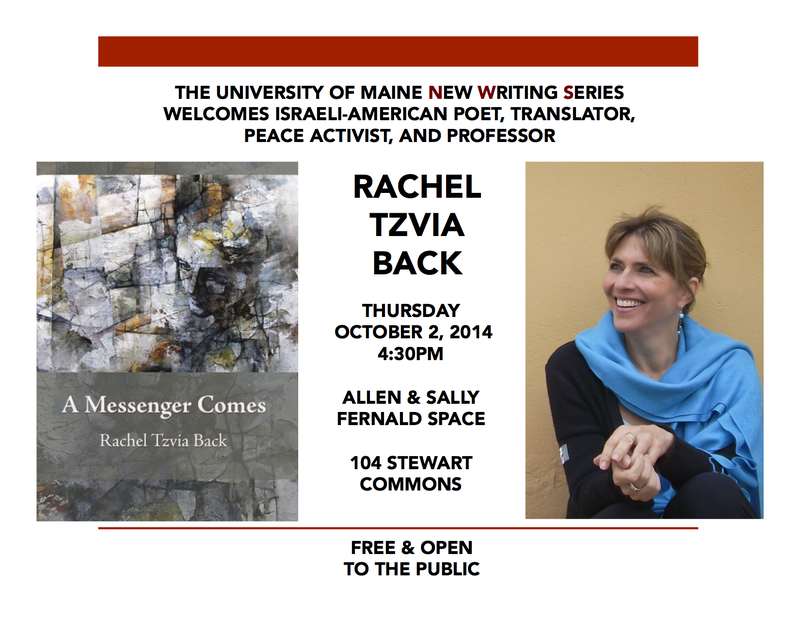 Rachel Tzvia Back is the author, most recently, of A Messenger Comes and On Ruins & Return. Her translation of In the Illuminated Dark: Selected Poems of Tuvia Ruebner was published in June 2014 by Hebrew Union College Press. With Tal Nitzan, she edited With an Iron Pen: Twenty Years of Hebrew Protest Poetry in 2009. Her reading will be introduced by Benjamin Friedlander, who will also host the discussion to follow. The UMaine New Writing Series was founded in 1999 and is sponsored by the English Department and the National Poetry Foundation with support from the Office of the Executive Vice President for Academic Affairs and Provost, The Fiddlehead Fund, the Lloyd H. Elliott Fund, the Milton Ellis Memorial Fund, the Honors College, the University of Maine Humanities Center, and the Cultural Affairs/Distinguished Lecture Series Committee. Grateful acknowledgment is made to the IMRC, and to donors Allen and Sally Fernald, for use of the APPE Black Box space. For more information contact Steve Evans at steven dot evans at maine dot edu or at 207-581-3818. 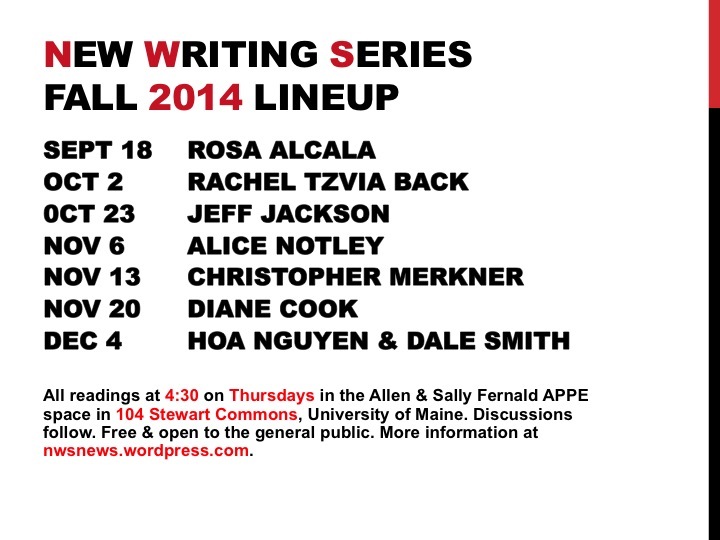 The New Writing Series presents poet and translator Rosa Alcalá (NWS S’04) this Thursday, September 18, at 4:30pm in the Allen and Sally Fernald APPE space in 104 Stewart Commons. The reading, which will be followed by a Q&A with the audience, is free and open to the general public. Rosa Alcalá is the author of two books of poetry, Undocumentaries (2010) and The Lust of Unsentimental Waters (2012), both from Shearsman Books. 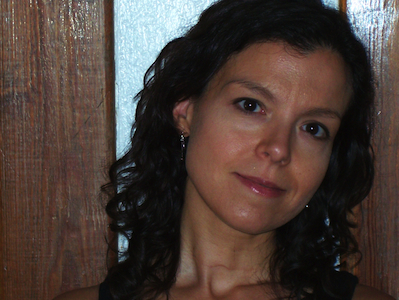 Spit Temple: The Selected Performances of Cecilia Vicuña (Ugly Duckling Presse, 2012), which she edited, translated, and transcribed, was runner-up for the 2013 PEN Award for Poetry in Translation. She has also translated the work of Lila Zemborain, Lourdes Vázquez, and other poets, with translations included in the Oxford Book of Latin American Poetry. She is currently an Associate Professor in the Department of Creative Writing and Bilingual MFA at the University of Texas at El Paso. Announcement of Alcalá’s recent NEA grant for Translation. Alcalá reads Rita Hayworth: Double Agent on Wordspace‘s Vimeo page. Alcalá’s poem Paramour at the Poetry Society of America‘s website. A conversation between Alcalá and Joshua Marie Wilkinson at J2. Mark your calendar, tell your friends, and come help us make it new!